Weekends are for being lazy, and there is truly no more of a lazy way to cook steel cut oats than inside of a pressure cooker. I got my instant pot back for my birthday I think and I am absolutely in love with it. Not only does it work as a pressure cooker, but also as a slow cooker; which saves me valuable cabinet space. So, while I'm slumming around still in my PJs today I thought it would be the perfect opportunity to make some Instant Pot Steel-Cut Oatmeal for breakfast... around noon. That's still technically brunch, right? This Instant Pot Steel-Cut Oatmeal literally takes 4 minutes to cook. BUT - that doesn't include the time it takes the pressure to build up, nor the time it takes for it to naturally drop. I would say from start to finish that the cooking process on these oats takes about 30-45 minutes. However, that 30-45 minutes of hands-off cooking. You just set it and forget it. Like I said, this is the lazy way to make steel-cut oatmeal. I loaded these oats up with chia seeds and flax meal too. Which gives you a boost of more of that healthy stuff that we all need and secretly want too. 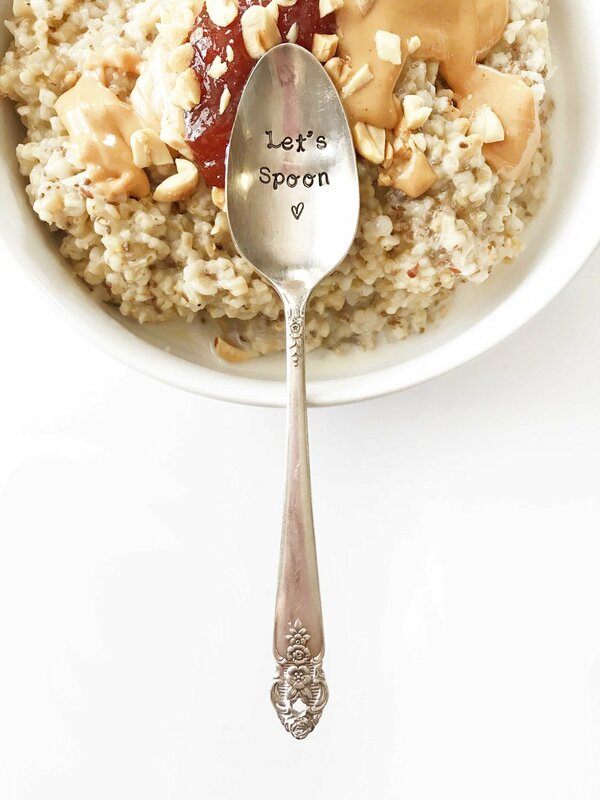 I gave my oatmeal the PB&J treatment today; completely with peanut butter, strawberry preserves and crushed peanuts. Which by the way, everyone should try because it's ammaaazingly good. A cross between breakfast and lunch for sure. However, feel free to add your own oatmeal favorites onto this one! Lightly coat the inside of your instant pot with non-stick cooking spray. Place all of the ingredients together into the base of the instant pot and seal the lid. Set the pressure cap to sealing and set the instant pot to manual for 3 minutes. Allow the pressure cooker to build up the pressure and cook the oats. When the pressure pin has dropped open and stir your oats. Devide evenly among bowls and enjoy with your favorite toppings!